This entry was posted in Uncategorized and tagged American Wild Horse Preservation, AWHPC, Cloud, Cloud Foundation, Deniz Bolbol, extinction, facebook, fertility, fertilty control, Forum on PZP, Ginger Kathryns, HSUS, Marybeth Devlin, mustangs, Neda DeMayo, Protect mustangs, PZP, side effects, Suzanne Roy, vaccine, wild horses by Protect Mustangs. Bookmark the permalink. This will be the extinction of our wild horses. The people who will ultimately be responsible for their extinction??? Advocates who are being certified and are using PZP. Well, that takes the weight off of the BLM, USFS, DOI, USDA and all of the persons who are supposedly representing us in Government. All this did was assure that the wild horses go extinct and that advocates will be to blame for it. Talk about the Government turning us against each other, well here you go!!! Where are the Wild Horses over populated and were the horses a pest when they were use for transportation, plowing, herding the cattle or just to ride, and do not say it was not wild because at one time all horses were Wild.Our horses help us and now we paid them back by round ups,PZP,slaughter and removing them from public land, their home/ safe place??? PERIOD. The over-population of Wild Horses is nothing more than a catch-phrase, because in realty there is no over-population — .e. several million cattle on Public Lands and not even 10,000 horses on Public Lands does not denote over-population of Wild Horses. The supposed 78,900 Wild Horses, rounded up and sent to slaughter in the past few years, and in excess of 4.8 million cattle (i.e. excess being over and above the amount of actual AUM Units-cattle appropriate for proper Range Land Management) on America’s Public Lands, denotes something is drastically wrong with the Bureau of Land Management’s Range-Management process. We can also pass judgement on the incorrect assessment of over-population within the numbers of birth randomly set by BLM at 20%; whereas, fatality numbers not included within this 20%, although necessary for a somewhat accurate count and necessary, because fatality of foals, for example, does exist — i.e. 18% death rate of foals at birth and into the first 3 months of life, add another 12% within the first year of their survival from broken legs, et al, fatally sick, Apex Predator attacks, etc, . . . Then the fatality rates of not only older Wild Horses, but through a Wild Horse life the percentage of survival low, and the strong survive, so we can also add another 18% toward low-life cycles. Numerous amounts of occasions can happen to reduce Wild Horse Herd size, that is not assimilated into BLM numbers at all. Incompetent? Absolutely! So we can consider what BLM has to say as nothing more than childish lies of the worst type, and it is cattle, not Wild Horses but the overabundance of Cattle that are not only destroying our Public Lands, but also culminating in very serious Global Warming attributes dangerous to our environment as well (i.e. see UN demanding countries start to adequately resolve issues enhancing Global Warming) . . .
BLM rather than lie must take a step forward, become adult rather than cowards in managing our Public Lands, and do it correctly, rather than allowing themselves to be bullied into situations that are ruining our environment as well as send America’s Icon, the Wild Horses, to slaughter. If BLM can not handle the task of managing our Public Lands differently, and honestly, then they need to be replaced, or the BLM shut down in total and another organization take over and manage our lands properly. There is NO wild horse overpopulation on any HMA – who comes up with the numbers?. I was fortunate to be close to the Cold Creek NV herd and immediately questioned the BLM’s ability to count the population when they dropped the “emergency gather” on us late summer 2015. They claimed they were removing approximately half of their counted population when, in fact, since the removal of over 200 horses, less than a dozen horses have been seen since (in almost 4 months…) Where are the remaining 200 horses they said existed in that particular HMA? Truth is, there were never that many to begin with. 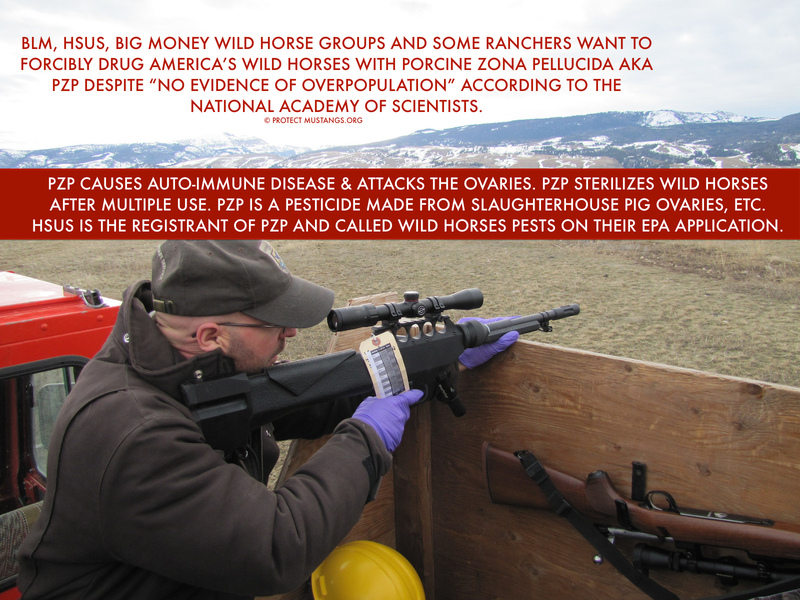 We need to legally challenge these BLM counts prior to their enacting roundups and other population control methods (PZP) on the herds — they are decimating entire populations, not even a proper cull – as any effective management solution should bring to the fore prior to ANY population control method. PZP is not the answer to stopping wild horse roundups, don’t let anyone fool you into thinking we only have those as viable options for the wild horse management. They are using the wild horses as test subjects – think about it ! There is no overpopulation of wild horses, drive out to Cold Creek right now and tell me, how many wild horses do you see? Most likely it will be NONE! Very well said John. Also, i am astounded, and Very Disappointed, that any mainstream ” Horse Advocacy ” group, would trust the BLM. Did not the BLM recently (illegally) allow a kill buyer to purchase and ship 1800 horses to slaughter? Did not the BLM just euthanize (but its rumored they shot,) 20 some horses in Nevada including pregnant mares? Our Majestic Wild Horses are penned in small enclosures now still with NO SHELTER from Winter Winds and Ice, with Huge manure piles to the sky, right inside THE MUDDY PENs. This has to STOP , NOW. Who are you evil people!!! We horse warriors also vote. Just remember that when the Safe Act Hr1942/S1214 Those who co-sponsor this bill are mostly democrats. This should not be a partisan issue. The problem exists all over the US, particularly Lochatee Florida. Temporary slaughter houses are set up and peoples privately owned horses are being stolen and butchered. One last thing, FIRE Tom Davis! WAKE UP AMERICA, GOD FOR CRYING OUT LOUD, IT IS TIME TO EXPOSE THE BLM AND THEIR HELPERS, THE PZPERS!! HOW SAD THAT THE HORSE ADVOCATES HAVE TURNED THEIR BACKS ON OUR WILD HORSES. THE PZPERS HAVE ACCEPTED THE BLMS LIES AND CONTINUE TO HOLD THE HAND OF THE ABOMINATOR AND ABUSERS OF OUR VOICELESS WILD HORSES. PLEASE TAKE A LOOK AT OUR PUBLIC LANDS AND YOU WILL NOT FIND MANY WILD HORSES, NOT FOR MILES AND MILES!!! AMERICA HAD BETTER WAKE AND STOP THE PZPERS BECAUSE THE BLM IS GIVING THEM FALSE INFORMATION! OUR EQUINE ADVOCATES KNOW THAT THE BLM HAS ALREADY REMOVED MOST OF OUR WILD HORSES!! NOW AMERICA IS NEARING THE COMPLETE EXTINCTION OF WILD HORSES AND WILD BURROS!!!! PLEASE STOP THE BLM AND PZPERS NOW BEFORE IT IS TOO LATE AND ALL OUR WILD EQUINE ARE WIPED OUT, EXTINCTION IS FOREVER!!! people…I have seen nothing that indicates they are anything but a bunch of corrupt individuals who ignore all the laws pertaining to our horses and simply get what they can for themselves while they can…surely there is a way to stop them before the last horse is shipped to slaughter or left to die in misery in a pen somewhere.